Please find attached lists of entrants for this weekend’s spectacular! The race program is also included. You can have a go at as many races you qualify (by age) for. 6.40 PM GRAND PARADE COMMUNITY RIDE All competitors and residents. 8.30 WACKY RACERS Adults on kids bikes! 9.15 DOOLEYS DASH Fancy dress, odd bikes and shed specials! Prize presentations to be made in between races on the Start/Finish line. Thanks one and all for supporting the event it should be a great night racing and plenty of fun! It looks like the weather is playing ball too!! Roads close at 6.30 pm sharp. Parking space is limited so please arrive early and park at the southern end of town on Clifton Rd by the sea. Alternatively you can leave your car in the Stone Field and ride to the circuit. This way you will be able to leave prior to roads opening if you wish. Do not attempt to drive to the circuit when the roads are closed you will block the street which we need to keep clear for emergency access. This is very important! Signing on will open at 5.45pm at Mt Tabor Hall. Sign on closes at 6.30 pm. You will need to fit a timing chip, don’t worry there will be people who will help you with this if you haven’t used one before. Dooley’s Dash and Wacky Racers will not be electronically timed so you don’t need to fit a chip to your bikes for these events. The main emphasis is on having fun so please bring your sense of humour as well as your bike and smile for the cameras. We are expecting a large crowd so let’s put on a great show! If you haven’t entered why not lend a hand at the event ? We are always able to welcome an additional pair of hands. Just a note to advise that the closing date for entry is 8.00 pm on Monday 16th September. There are 60 entries to date, 32 Youths and 28 Seniors, thanks to all who have sent forms in. All the arrangements are coming together well. There is more powerful flood lights than last year, music and commentary along the ‘back straight’, 2 food outlets and plenty of prizes which should make the whole event more enjoyable. Plus some surprises that will only be revealed on the night! A few people (spectators) have asked if the competitors can use lights on their bikes this year. Not to assist with lighting the circuit but because it makes photographs and viewing more spectacular. So if you have lights can you use them, they are really light weight and shouldn’t impede your performance! For the Mountain Bikers out there smooth tyres are acceptable its entirely up to you whether you use them or not, just have fun! The event running order has been shuffled this year to ensure that Senior competitors get a recovery time in between races. Blackfords Insurance Brokers and Port St Mary Commissioners have donated new trophies this year for the Championship and Veterans races. There is also a trophy for the Youth A class. Don’t forget fancy dress, retro kit or period dress for the Dooley’s dash. Special Spot prizes for this category and the Wacky Racers. The Charities that will benefit this year Southern Nomads Sport Erin and Craigs Heartstrong Foundation (via Port Erin coast Guard). Both organisations are providing work parties and Stewards for the event. 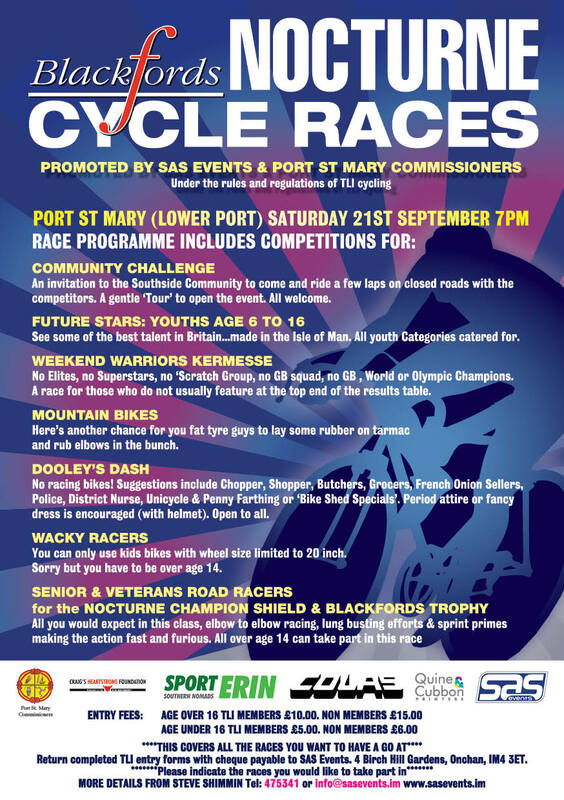 Sponsors Blackfords Insurance Brokers, Port St Mary Commissioners and the Southside community are really looking forward to welcoming the IOM Cycling community back for this event. We are pleased to announce that tickets for the IOM Cycling Dinner and Annual Prize Presentation are now available. The dinner will be held on Saturday 26th October and carries a cost of £40 per person. Tickets are on a first come first served basis and cannot be reserved by email. 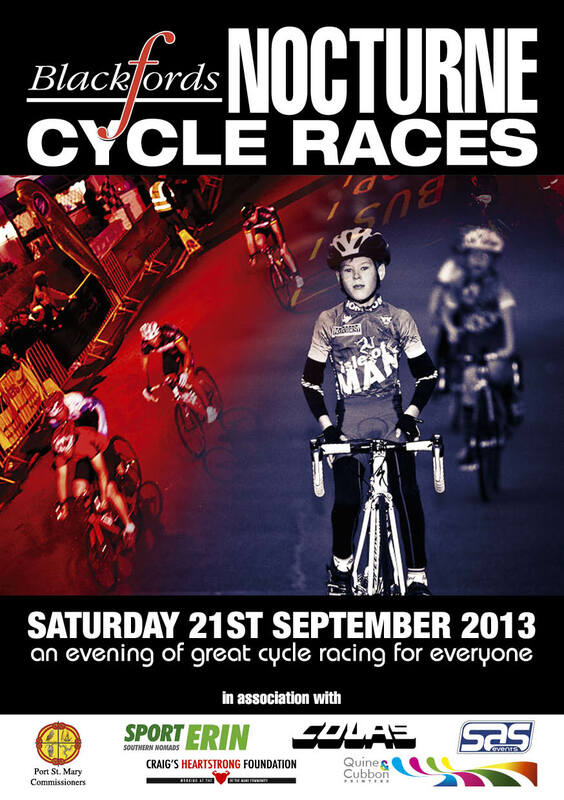 To book your tickets please send a cheque payable to the IOM Cycling Association to Cedar Lodge, Braaid, Isle of Man. IM4 2AL. There will be no paper tickets, please include an email address and we will confirm your tickets by email upon receipt of your cheque. Any seating requests should be included with the cheque but please make sure those you are requesting to sit with have also sent payment. Also please indicate any special dietary requirements.